First I bought some adhesive wallpaper from Home Depot and cut it to size for my cubicle walls. And because I didn't want to leave any sticky mess, I used velcro to attach it. I spray painted all of my desktop accessories silver (I bought these all myself over the years and brought them into work) . 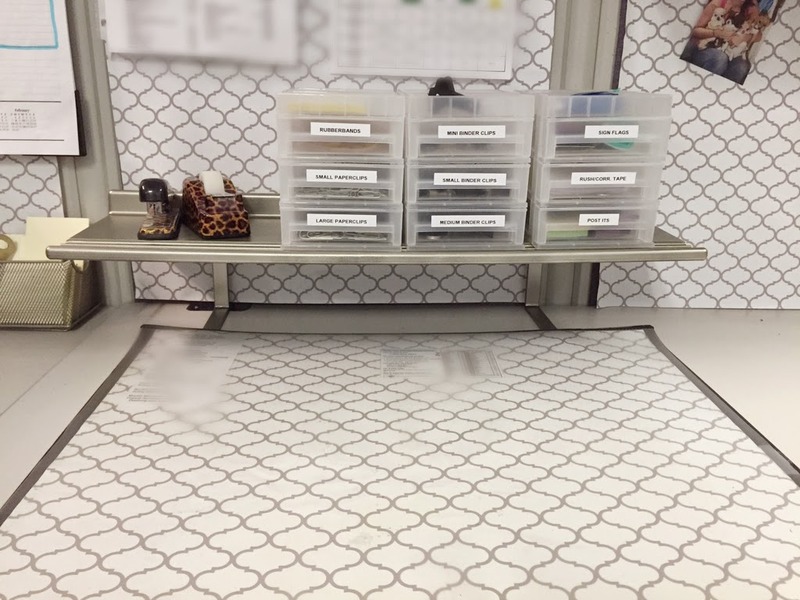 I got some really nice inbox trays from The Container Store to match the rest of my accessories. And I got tiny little drawers from The Container Store for my office accessories. To display my photos I got some Tulle from a coworker and hung photos off of it. I even decorated the clothespins with washi tape! Not only do I get lots of compliments but I truly love my little cube. I feel more clear headed while I work.